The key to consuming carbohydrates is to ensure that they are good sources of important nutrients. The current dietary guidelines stress the importance of limiting carbs in the form of added sugars. Despite all the hype about “low-carb” diets, many people have an incomplete understanding of carbohydrates. It helps to look at a Nutrition Facts label, which lists quantities per serving of total carbohydrates, dietary fiber, and sugars. The amount of starch isn’t listed, but that’s the third component of carbohydrates: Subtract fiber and sugar from the total and the remaining carbs represent starches. Sugars and starches feed your body in the form of glucose, a simple form of sugar, which the body breaks down from carbohydrates in foods such as fruits, vegetables, grains, and dairy. Your body requires a constant supply of glucose; for your heart, glucose provides the energy to keep pumping. Your brain also relies on glucose as its primary energy source—and it demands a disproportionately large share. Glucose is among the few substances able to pass unhindered through the blood-brain barrier. Because brain cells can’t store glucose like cells in other areas of your body, they require a steady stream of glucose throughout the day. Areas of the brain that control thinking are sensitive to drops in glucose, which is why you might have trouble concentrating or thinking clearly if it’s been several hours since your last meal. The importance of carbohydrates to the brain is reflected in the Recommended Dietary Allowance (RDA) for carbohydrates. For adults of all ages, the RDA is 130 grams daily (the equivalent of 520 calories), a number that is based on the brain’s glucose requirement. The Institute of Medicine (IOM) suggests that carbohydrates account for 45 to 65 percent of your total calories; other recommendations vary. The key to consuming carbohydrates is to ensure that they are good sources of important nutrients. Avoid foods and beverages that are high in carbs from added sugar and/or refined flour, such as soft drinks, white bread, and desserts, which are high in calories but have minimal nutritional value. The current dietary guidelines stress the importance of limiting carbs in the form of added sugars. You know about the downsides of added sugars, but emerging evidence suggests that you also should go easy on starches. Research has spotlighted starches as a culprit in weight gain and diabetes, both of which contribute to your risk for cardiovascular disease. One study, for example, reported that high intakes of starchy vegetables such as corn, peas, and potatoes were associated with weight gain. In the same study, diets higher in fruits and non-starchy vegetables were linked with weight loss. “The study builds on earlier work that suggests all calories are not the same,” says Tufts’ Dariush Mozaffarian, MD, DrPH, senior author of the study. Potatoes were the number-one culprit in weight gain among study participants. “It didn’t matter whether they were boiled or baked or mashed or French fries or had fat in them or didn’t have fat in them,” Dr. Mozaffarian explains. “It was the starch.” The weight gain associated with starches from refined grains was identical to that from sugar-sweetened foods. A simple rule of thumb, he says, is to look for foods with a ratio of total carbohydrates to fiber of 10:1 or less. For example, a product such as white bread with 15 grams of carbohydrates and one gram of fiber would have a ratio of 15:1—not a good choice. Another study linked higher starch consumption to a greater risk of type 2 diabetes in women. 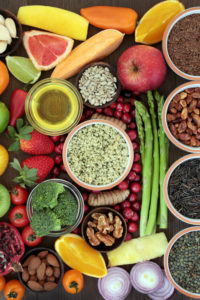 However, higher intakes of total fiber, cereal fiber, and fruit fiber were all associated with lower diabetes risk, emphasizing the importance of choosing your carbs carefully. For more information about carbohydrates, purchase The Heart-Brain Diet at www.UniversityHealthNews.com. 2 diabetes, blood brain barrier, brain, breakfast, calories, cardiovascular, cardiovascular disease, cauliflower, corn, dairy, diabetes, diabetes risk, diet, dietary guidelines, dietary guidelines for americans, fiber, glucose, institute of medicine, milk, nutrients, nutrition, nutrition facts, nutrition facts label, nutritional value, potatoes, refined grains, stress, sugar, type 2 diabetes, vegetables, weight gain, whole grains, whole wheat, yogurt.